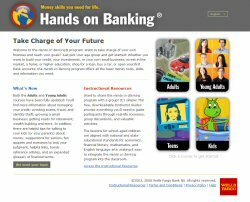 Pam Erwin gave us a great pointer to Wells Fargo’s Hands on Banking program which provides instructional resources and online classes in financial skills. Courses are available in English and Spanish and four grades: Kids, Teens, Young Adults, and Adults. We are going to be drawing on these lessons and the great instructor guides (available as pdfs) to add a financial skills component to the transition programs we offer. We would welcome any feedback about this program or other programs you have heard of. This entry was posted by Dan Swearingen on Monday, November 9th, 2009 at 12:55 pm	and is filed under Jobs & Employment. You can follow any responses to this entry through the RSS 2.0 feed. Both comments and pings are currently closed.